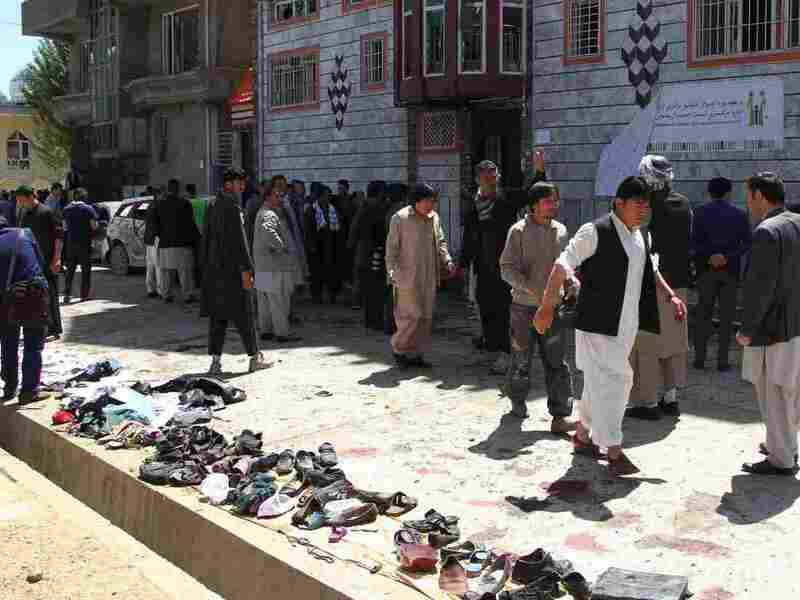 Suicide Bomber Kills Dozens At Voting Center In Afghanistan : The Two-Way More than 50 people attempting to register to vote have been killed in a suicide blast in Afghanistan's capital, Kabul. The Islamic State claims responsibility. People gather around the scene of a suicide bomb attack that targeted a voter registration center in Kabul, Afghanistan on Sunday. In Afghanistan, a suicide bomber has killed at least 57 people registering to vote at a center in Kabul, according to a Public Health Ministry spokesperson. More than 100 others have been injured. Afghan police say 22 women and eight children are among the dead. Photos of the attack show a scene of chaos and terror in the country's capital - people strewn on the ground, personal documents abandoned, streets stained crimson with blood, vehicles damaged by the blast. The AP reports the bomb's vibration could be felt across the city, shattering windows miles away. Following the blast, abandoned victims' shoes were placed in a row, perhaps for people to claim afterwards. The Islamic State has claimed responsibility for the attack. The terrorist group's Amaq News Agency says it targeted Shiite "apostates." Afghan police say many of the people killed were waiting in line outside the center, attempting to receive national identification cards in order to vote. Parliamentary elections are currently scheduled for October. Voter registration in Afghanistan has been low - groups in opposition to the government have threatened violence at such centers, and a string of fraudulent and delayed elections have caused voter apathy. Millions are yet to register, and if they don't, the vote is likely to be delayed. Parliamentary elections have already been delayed by three years. According to the BBC, this is the fourth attack on a voting center since registration began at the beginning of the month. The string of attacks suggest the extremist group will try to undertake more attacks to undermine the expected elections. Separately, in northern Afghanistan a roadside bomb detonated killing at least five people and injuring at least three others, according to local police. The explosion occurred near another registration center, although there has been no direct link indicated between the two attacks. There has been no immediate claim of responsibility for the bombing. Afghan security officials say more than 1,000 voting centers are under high security threats, and 950 are outside of the government's control.